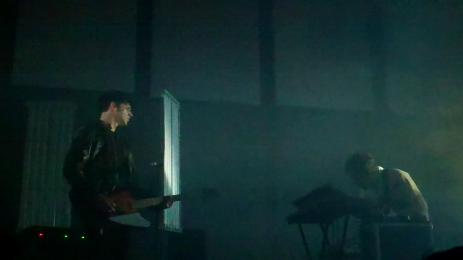 Of course, at this point, I've been well-habituated to The Soft Moon's live set, this being the third time seeing them over a two-month span, but that did not lessen their impact in the slightest, and it was heartening to see people who were obviously not familiar with their material stop and take notice. We came in a bit late (bad habit, and not normal practice, but we had to get something to eat) but did catch half of Water Boarders set and generally liked what we heard. 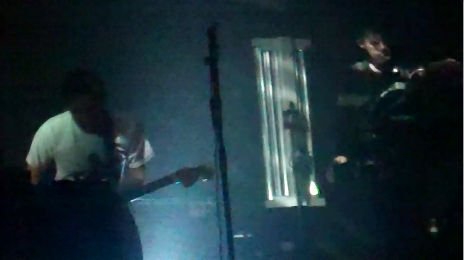 "When It's Over" was played here for only the third time, it was debuted at the Feb 6th show at the Echo and LA and played again on one of their other SoCal dates (Long Beach, I am informed). It's quite rightly deemed the emotional centerpiece of their album...and this show. 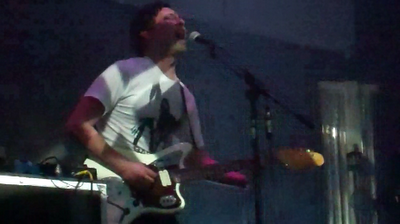 Luis wearing a Bad Brains shirt was a nice touch, which he revealed after the first song (was hot on stage!). I can't say enough for how good these guys are, so I won't bore you trying. Credit goes to the bloke who runs ESWA who turned me onto something that was in my own backyard the whole time. As for any comments about the headliner, I'll pass. I refer you instead to Bob Duvet's excellent article, who also has very nice things to say about The Soft Moon. And debuted here, the COMPLETE VIDEO, shot with my Flip UltraHD at 720p and stabilized with a Ready Steady, I declare this amazing, yes it's weird to make this comment as if it were somebody else filming. TH1 version, recorded with my new Church Audio CA11 cardoid mics, running into the rarely-used Belkin Tunetalk plugged into an iPod 5th gen classic. It's actually pretty decent after some re-EQ. Includes the final Water Borders track. TZ0 version, recorded with Sonic Studios DSM-6s/Ls into an Edirol R-09HR. Also includes selections from the other groups if you're interested. A blend (aka "matrix mix") of both recordings, which I think is the definitive version, and is also used as the soundtrack of the full video. You can grab this one if you're not a TSM completist and just want something to listen to.